Are there some vegetables you can't stand? It may be genetic. Ever wonder why some people think cilantro tastes like detergent while others scatter it over everything? Or why brussels sprouts are delectable to some and disgusting to others? Part of that difference of opinion may lay in our genes. To some extent. There is still a lot about human perceptions of taste that we don't know about, but we are gradually forming a better picture of this sense and how are genes come into play. Humans perceive five basic tastes: sweet, sour, bitter, salty, and umami. We've identified receptors that are responsible for our perception of bitterness, sweetness, and umami, all of which bind to G proteins. Umami and sweetness are detected by Type I taste receptors in humans. The genes TAS1R1 and TAS1R3 encode proteins that act as a dimer to for the receptor for glutamate, which we interpret as umami (which is why monosodium glutamate, or MSG, has been used as a common flavor enhancer). The genes TAS1R2 and TAS1R3 encode the proteins that act as receptors for a number of sugars and sugar substitutes. Bitterness is detected by Type II taste receptors—and 25 different functional genes that code for receptors for a variety of bitter compounds have been identified. Genes have also been identified that are connected to our perception of sourness (PKD2L1) and fat (CD36). Taste receptors are only part of the picture, however. Flavor, after all, is based on two senses: smell and taste. When considering whether there is a genetic component to our love or hatred of a certain food, it's not just the taste receptors but the olfactory receptors that can come into play. And then there is the timeless question of nature versus nurture. How much of our appreciation of certain foods is rooted in our genes and how much is based on our environment and experiences? The answer may be different for different types of food. A study recently published in the American Journal of Clinical Nutrition looked at the food preferences of Gemini, a cohort of twins born in the United Kingdom in 2007. Looking at the data, the authors found a stronger link between genetics and food preference regarding more nutrient-dense foods (vegetables, fruits, and proteins, in that order), and a stronger link between environment and food preference when it comes to starches, snack foods, and dairy. However, it's important to note that our tastes do change as we get older; the number and mass of our taste buds decrease as we get older and we can learn to appreciate flavors that we didn't when we were younger. Still, different individuals do have different perceptions of different tastes and odors, and there does seem to be a link between possessing certain variations of certain genes and hating certain foods. Is there really a cilantro gene? When I was in college, I had a roommate who hated cilantro. She kept insisting that the flavor-enhancing herb that I routinely slathered on my rice and beans tasted like soap, and I simply assumed that she was a crazy person. But debate over whether cilantro is a delicious or disgusting plant has raged since time immemorial. Since the major complaint that cilantro-haters have is that cilantro has that soapy flavor, it makes sense to suspect that there is some genetic perception component to disliking cilantro. The folks behind the personal genomics company 23andMe published a study that proposed that the olfactory receptor gene OR6A2 could be responsible for detecting a soapy odor in cilantro, at least among European populations. Comparing the genetic profiles of people who do detect a soapy flavor in cilantro with those who don't, the researchers associated a single-nucleotide polymorphism (SNP) located on chromosome 11 with detecting that soapy flavor. They further notes that one of the genes near this particular SNP is OR6A2, which codes for a receptor that detects aldehydes. Furthermore, the aldehydes found in cilantro have been known to activate this particular receptor. That makes OR6A2 a good candidate for a gene that determines whether we like cilantro. However, the authors of this study observed low heritability (which is to say, a low proportion of observable differences in the trait between individuals due to genetic differences) between the SNP and hatred of cilantro, saying that it explains only 0.5% of the variance in perceiving a soapy flavor in cilantro. They noted that there may be other genetic factors at work, and a study published around the same time in the Journal of Chemical Senses suggests that may be the case; that study found associations between perception of cilantro flavor and variations in the bitter taste gene TAS2R50, as well as the genes TRPA1 (which may be linked to the ability to perceive caffeine and a pungent sensation caused by olive oil) and GNAT3 (which is also linked to basic taste). So hatred of cilantro may very well be genetic, but chances are it is more complex than a single variation of a single gene. 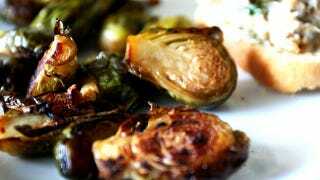 An evolutionary reason for hating brussels sprouts? Out of all of the genes for perceiving bitterness, perhaps the most studied is TAS2R38, which is frequently termed the "PTC gene." There's a sort of amusing story behind the singling out of TAS2R38 as an interesting gene for taste perception: A DuPont chemist named Arthur Fox was working with phenylthiocarbamide (PTC) in the lab when a colleague complained about the offensive bitterness of the chemical. To Fox, PTC had no flavor at all, and he found that when he asked other colleagues to taste it, some people found the stuff bitter while other tasted nothing. The ability to perceive the taste of PTC as bitter is linked to a dominant allele of the gene TAS2R38, although it's worth noting that TAS2R38 isn't the sole determinant of whether a person can or cannot taste PTC; other tasting genes and environmental factors come into play. Still, people who possess the dominant allele for PTC tasting are typically PTC tasters while people who possess two copies of the recessive allele are typically not PTC tasters. There is also a phenomenon known as "supertasting," that is linked to an ability to tasting the compound 6-n-propylthiouracil (PROP) as bitter, but that depends on more than variations in the TAS2R38 gene. PTC isn't found in nature, but the ability to taste PTC (and possession of the dominant allele for tasting PTC) correlates strongly with the ability to taste other compounds as bitter, notably glucosinolates, which are found in the genus of plants known as cruciferous vegetables or Brassica. The Brassica genus includes cabbage, cauliflower, broccoli, Brussels sprouts, and kale, which are extremely bitter to some people and not bitter to others. You can test whether you are yourself a PTC taster at home by chewing on PTC taste test strips and seeing if they taste bitter to you. Supertasters tend to have aversions not just to cruciferous vegetables, but also to coffee, grapefruit, soy, and a number of other foods. Why do some people carry around a genetic distaste for kale? Some researchers have theorized that the ability to taste PTC is linked to the ability to taste toxins. For example, goitrin, which is formed by the hydrolysis of a glucosinolate and is found in cruciferous vegetables (albeit in small amounts), can be toxic to humans in high doses. Tasting some foods as extremely bitter might have been a way for humans to avoid ingesting toxins. There may be other functions of the TAS2R38 to consider as well, functions that we are only just beginning to understand. A paper published last year in the American Journal of Rhinology and Allergy found that TAS2R38 was expressed not just in the taste cells of the tongue, but also in the cilia of sinonasal epithelial cells. They suggest that TAS2R38 might be linked to the ability of these epithelial cells to sense bacteria and that variations of the gene could be related to a person's susceptibility to upper airway infection. So your appreciation for or hatred of brussels sprouts might signal other qualities of your body unrelated to what you eat. What happens when we breed the bitterness out of our foods? One question that arises out of the discussion of the genetics of food preference, especially where bitter vegetables are concerned is whether we should breed vegetables to be less bitter. The answer to that is: we already have. Vegetables are frequently bred to be lower in the phytonutrients that give those vegetables a bitter taste in order to increase consumer acceptance of those vegetables. The problem is that the removal of those nutrients have consequences: they make the plants both less nutritious and more susceptible to disease and microbial attacks. We may be trading a bit of bitterness for vegetables that give us more of the bad stuff—in the form of synthetic pesticides—and fewer of the nutrients we need.